The Indian Congress was held from August 4 to October 31, 1898, in Omaha, Nebraska, in tandem with the Trans-Mississippi and International Exposition. Taking place less than a decade after the end of the Indian Wars, the Indian Congress was the largest such gathering of Native American tribes to that date, bringing together over 500 Native Americans representing 35 different tribes. The Indian Congress was managed by Captain W. A. Mercer of the 8th U. S. Infantry, under the direction of the Commissioner of Indian Affairs acting on behalf of the Secretary of the Interior. Omaha Public Library's Indian Congress collection consists of photographs that the official photographer of the Trans-Mississippi and International Exposition, Frank A. Rinehart, and his assistant, Adolph Muhr, made of individual tribe members, their temporary lodgings, and the various scheduled events of the Congress. It was James Mooney, a Bureau of Ethnology ethnographer, who designed what was essentially a living exhibition of Native Americans, and it was he who contracted with Frank Rinehart to photograph the Indian delegates during the last week of the Congress. The Omaha Public Library's collection includes many atlases and maps documenting the history of Nebraska and its towns and cities. Accumulated over many years, they range in date from 1854 to the late 1900s. The town of Millard, Nebraska, was platted by Ezra Millard, president of the Omaha National Bank and a prominent business man, in 1873, on land that he had bought in 1871. The town grew and flourished until its expanding tax base caught the eye of Omaha city administrators, and after a legal battle against the town's resistant citizens, Millard was annexed by the city of Omaha in 1971. Omaha Public Library's Millard Town Collection includes photographs, scrapbooks, and papers and clippings documenting the annexation battle. Omaha, founded in 1854, is the site of the Union Pacific headquarters and point of eastern origin for the first trans-continental railway to be built across the west, the greatest western trail of the nineteenth century. Omaha became the home to many seeking their fortune and to immigrants who worked for the railroads, meat packing houses, and businesses trying to supply the demand for goods to the west and east. The Omaha Public Library's collection includes books, original materials, maps and images relating to the history of Omaha, documenting the process of Omaha transforming from a town into a city by being a "gateway" to the west. Omaha Public Library participated in the Western Trails digitization project and is a contributer to the state-wide Nebraska Memories digital library. Omaha Public Library has a long history. An Omaha Library Association was established in 1857 but, lacking funds, failed in 1860. After several attempts another association was formally organized in 1872 by several prominent Omaha men, who opened a tiny library on the second floor of the Simpson Carriage Factory on the southwest corner of 14th and Dodge Streets. On June 13, 1877, the Omaha City Council appointed a library board, levied a tax, and accepted a gift of 4,500 books from the disbanded association. At that point the Omaha Public Library was born. For 17 years the library moved from one location to another until real-estate tycoon Byron Reed donated land and his vast collection of coins, books and manuscripts to the library. On July 5, 1894, the Omaha Public Library opened in its first permanent home in a stately new Italian Renaissance-style building (designed by renowned architect Thomas Kimball) at 1823 Harney Street. A year later, Omaha Public Library set itself apart as one of six public libraries in the nation to establish a separate children’s section. For many years, the library also housed a museum, which began as a repository of souvenirs from the Trans-Mississippi & International Exposition held in Omaha in 1898 and grew to include “items of interest and value” of all kinds, from Native-American relics to paintings to mineral specimens, donated by individuals and organizations. Over the years, the Omaha Public Library system expanded to include today’s 12 branches, several of which began as independent libraries. In 1977, the main branch of the library moved from Harney Street to a modern new construction of Bedford limestone, occupying 124,500 square feet of space across from Gene Leahy Mall Park at 14th and Farnam Streets. The new main library, designed by the architectural firms of John Latenser & Sons and Hellmuth, Obata, Kassabaum, Inc., was named for W. Dale Clark, longtime banker and library board member. The Trans-Mississippi & International Exposition of 1898 and the concurrent Indian Congress were held in Omaha, Nebraska, from June 1, 1898, through November 1, 1898. The Exposition showcased the developed West from the Mississippi River to the Pacific Coast. Business and community leaders from the 24 states and territories lying west of the Mississippi River envisioned the Trans-Mississippi Exposition as a way to revitalize the regional economy and to show that the West had recovered from the financial panic of 1893. 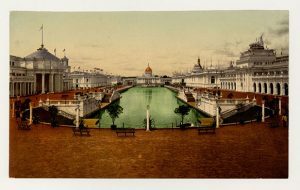 Omaha Public Library's Trans-Mississippi & International Exposition collection consists primarily of the Frank Rinehart official photographs of the exposition. The library owns about 3,000 of these rare original images, as well as other narrative and descriptive materials about the Exposition's events, exhibits, midway attractions, and Indian Congress. William Wallace was a prominent early resident of Omaha who had a successful career in the Omaha National Bank. We will remember him best, however, as an avid amateur photographer who left behind a collection of several thousand photographs, lantern and stereopticon slides, and negatives documenting early twentieth-century views of Omaha, Nebraska; his vacation home at Lake Okoboji, Iowa; and his travels abroad and through the United States. This collection, at his behest, was donated after his death to Omaha Public Library, an institution he staunchly supported during his lifetime. The collection is notable for the many rare views it provides of scenes not often documented in early photographs, including poor areas of town, settlement houses, building interiors, and many casual, unposed shots of people and pets. The 1259 image world stereoview collection was given to Omaha Public Library by Charles Nelson Dietz (1853-1933) who made his fortune in Omaha in the lumber business. From 1912 to 1930 Mr. Dietz served as President of the Omaha Public Library Board, and until his death in 1933, as President Emeritus. During the last 30 years of his life, he and his wife Nettie traveled extensively all over the world, visiting Africa thirteen times. The images in our digital collections are displayed online as low-resolution jpg images, which members of the public are welcome to use as is (giving credit to Omaha Public Library). High-resolution TIFF images can be purchased. View our Digital Image Policy for more details.